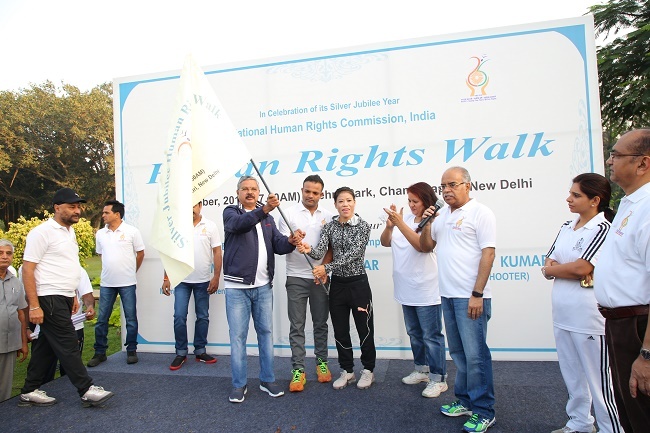 The three day-long extended celebrations of the silver jubilee of the National Human Rights Commission concluded with the ‘Human Rights walk’ at Nehru Park in New Delhi today morning on the 14th October, 2018. It was flagged off by NHRC Chairperson, Mr. Justice H. L. Dattu, and celebrated sportspersons, Ms. J. Mary Kom, boxer and Mr. Vijay Kumar, shooter. Scores of people, including women and children, representing were sections of society participated in the walk organized by the Commission to build awareness on human rights and seek people’s commitment to promote and protect them. Live and let live ethos is an embodiment of a sportsman’s spirit, which is imbibed in Indian culture. That is why, the Secretary General, Mr. Ambuj Sharma, in a brief address before the start of the Human Rights Walk, said that the Commission was thankful to both the leading sportspersons of the country for their participation in this event, which was also meant to send across a symbolic message of brotherhood and peace. Mrs. Jyotika Kalra, Member, NHRC and other senior officers also participated in the walk. Earlier, the Commission organized a Human Rights Mela and Street Theatre Festival of its own kind in the country at the amphitheatre arena of Central Park, Rajiv Chowk (Connaught Place), New Delhi yesterday on the 13th October, 2018. It was inaugurated by Mrs. Jyotika Kalra, Member, NHRC. Seven selected groups performed their street plays on different aspects of human rights and competed for the covetous awards. A jury, headed by Mrs. Jyotika Kalra, Member, NHRC comprising Mr. Surajit Dey, Registrar (Law) and Mrs Sumedha Dwevedi, SSP, NHRC judged the plays for the awards. The first prize of Rs. 1, 00,000/- went to the Street Play Society of Janki Devi Mahila College, Delhi University for their play -‘Maila Kuchaila’ highlighting the challenges of the manual scavengers and the need to protect their rights to life, dignity and equality. The second prize of Rs. 60,000/- went to Rudraksh Kala Mandal for their play- ‘Apna Adhikar Pechano’ highlighting how to deal with domestic violence targeting women and take legal recourse approaching the rights bodies and the third prize of Rs. 40,000/- was given to Jazba Theatre group’s play ‘Bhookh’ highlighting the challenges related to protection of right to food and how the people can themselves better ensure it by avoiding wastage of food. Besides all the seven participating groups will be paid Rs 25,000/-each. Presenting the awards, Mr. Ambuj Sharma, Secretary General, NHRC said that the Commission, in addition to the traditional news media, is now exploring various alternative media platforms to spread awareness on human rights seeking peoples’ participation and involvement. The NHRC’s human rights short film festival and human rights street theatre festival are the part of the same endeavour, besides some other events. He said that in future, the Commission would expand the scope of human rights street theatre in different languages across the country so that the message about the importance of protecting human rights reaches to the people directly at grass roots level in the language they understand and appreciate better. Dr. Ranjit Singh, JS (P&A), Dr. Sanjay Dubey, Director (Admn. ), Mr. Jaimini Kumar Srivastava, Dy. Director (Media &Comm.) along with other senior officers and staff of the NHRC were present. Hundreds of people watched the street plays and visited the Mela, which provided an evening of fun, entertainment, education and information with a focus on motivating people to stand up for the promotion and protection of human rights. The Delhi Police teams also presented the performances of their pipe band, Women self defence techniques and a skit to show how to approach Delhi Police control room in the hour of distress. There was also presentation of music and songs in between theatre performances. Stalls were set up around the amphitheatre by leading NGOs, like Help Age India, Bachpan Bachao Andolan, Delhi police, Paramilitary forces, Tihar Central jail besides the NHRC showcasing their work. Some books, literature and articles were also available for sale at the stalls. On the first day of the beginning of the three day extended celebrations, i.e. on the Foundation Day of the Commission on the 12th October, 2018, a special programme was organized at Vigyan Bhawan, New Delhi which was addressed by the Prime Minister, Mr. Narendra Modi, the Union Home Minister, Mr. Rajnath Singh and NHRC Chairperson, Mr. Justice H.L. Dattu in the august presence of the Union Communications Minister Mr. Manoj Sinha and several other dignitaries including NHRC Members, Mr. Justice P.C. Ghose, Mrs. Jyotika Kalra, former Chairperson, Members and senior officers, besides a host of other dignitaries including judges, parliamentarians, diplomats, academicians, civil society members, representatives of State Human Rights Commissions and other National and State Commissions, media as well as senior government functionaries. A commemorative postal stamp and cover marking silver jubilee of the National Human Rights Commission, India was released and the new version of the NHRC website was also launched by the Prime Minister.